Now I am watching this 1940’s propaganda film for the internment camps in which we placed Japanese-Americans. I recommend it, as contains a great deal of information about camp conditions, which are quite gulag-esque despite all attempts at positive spin. It seems that the modern concentration camp was invented in the 1890’s. Spain had them in Cuba, to prevent civilians from aiding and abetting insurgents, and Great Britain had them in South Africa for Boer and African civilians. These were not intended as death camps, but I am told that as many as 25% of the inmates died. On detention camps in the United States currently, investigate these terms: Rex 84, Operation Garden Plot, and Conplan 2002. All sound like the overheated imaginings of conspiracy cranks, but are not. For the next few days, I will be located (when not in class) primarily at the New Orleans Jazzfest and the Festival International de Louisiane. For an approximate idea of what it will be like, I refer everyone to the videos on my entries in songs. 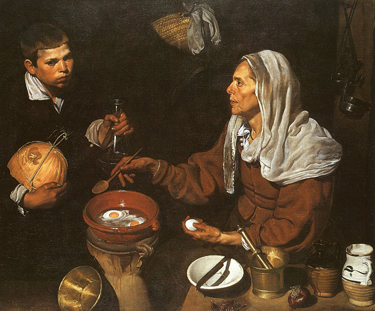 In the meantime we will contemplate Velázquez’ Old Woman Frying Eggs (1618; National Gallery, Edinburgh; I have the same casserole and I fried eggs in it, so it looked exactly like this), read this post by Jesus’ General in its entirety, and follow the instructions contained therein. Then we will move on to “Because If I’m Perfect Enough, Maybe You Won’t Hate Me Anymore” by the Hedonistic Pleasureseeker, to Xicano Power’s latest on border wars and immigration bills, and to John Brown’s The Cho in the White House. I am glad Brown wrote what he did, because I wanted to and was afraid; his are, however, also my sentiments exactly. Finally, we will look at some summer clothes I like, including the shoes, and read R. D. Laing with Nezua. More poetically than I, Anne Waldman asks whether it is illuminating to think of poetry as a career, or in relation to careers. The connection to institutions. To commerce. The origin of the word career in chariot races. I would rather think of trajectories than races. Freeing the work from both competition and from establishmentarian connotations. I understand the establishment and can work with it on my terms. My best work speaks to it, but is not bound up with it. These are some earlier notes on Anne Waldman’s Outrider and a few of my reasons for reading it. Continuing, I will excerpt from the second and third pieces in the book, and bold the phrases which most strike me. This reading is turning me slightly Buddhist. –Milan Kundera, The Joke (New York: HarperCollins, 1992). I quite liked this novel, for reasons I am sure critics better versed than I have already discussed. A different comment is that the world of this text was to me foreign in many ways, not only because it is from an unfamiliar land but because the text is so…macho, I want to say. My unscientific intuition is that even novels of the Mexican Revolution do not speak from inside such a machista world with no exterior. Kundera’s men are soulful and wronged, it is true. Still it seems to me that they react to the world in ways only the entitled can. Here are some fragments from the first section of Anne Waldman‘s Outrider (Albuquerque: La Alameda Press, 2006). I love poetic manifestos, and I have just discovered an entire web archive of them. And someone at Western Michigan has excerpted portions of Olson’s 1950 manifesto Projective Verse for the sake of contemplation. I am engaged in the same sort of activity here. If I excerpted though, on a different day, I would surely choose different lines. Is poetry as profession in crisis? That’s the view of OUTRIDER. It’s a question. A view inside maker/marker/poetry inside a question. What are thoughts? Where do they go? How do they form? What are the portals, the ayatanas, for this poetry-head-restless-in-process-of -shaping-itself-through-language, wanting that to be enough for a whole life, yet troubled in “economy,” in “career,” in “maintenance,” in bad governance. OUTRIDER seeks as view, this OUTRIDER motif, a way into the poet’s role in a creative world increasingly commodified. That sounds resoundingly glib. However. Where did poetry start streaming in a poet? That would be a starter. Utopian poetics, what you want to read. Start with poem as career. Perhaps, ideally, where poetry presents, offers, little product value …It inculcates “a way into,” it is a process of becoming shapely of becoming mind/language/imagination/music shape-of – what form could that be, how might a semantics hold all this? Historical precedence surely. OUTRIDER as a term, a concept, a battle cry (because one is a warrior in 1974) is born in 1974 at The Jack Kerouac School of Disembodied Poetics, Naropa Institute (later University). It’s a wild mind experiment. How is the call heard? First it is heard. A line somewhere? Propensity. It is available, this view, this modus, in response and as an alternative to poetry as a career. Or of at least thinking of it that way. Operating in it – the composition by rhizome field – that way, as if poetry is an excursion and a necessity. What is the sexuality of the poetics of OUTRIDER? That’s just it. Invoking the notion of “coming out,” of being outed, of being outside the norm. Recognizing the linear body, lunar body, illuminated body, liminal body. Body poetics. One who rides outside the normative strategy, who will brook no obstacle to the next kinetic moment. What OUTRIDER desires is a return to urgency for the work because we are trying to wake up the awareness of the world. Not in a safer academy, although maybe help from there would come. OUTRIDER will listen and keep a record, scribed indelibly in water in sand, in a saddlebag with items of regret. A popular song with no closure is familiar to OUTRIDER. OUTRIDER is a witness and an animal-plant-mineral citizen, and strives to make change in the realm of inclusion, inasmuch as OUTRIDER can be persuasive, and inclusion might be a goal. Inclusion in what? The discourse. OUTRIDER is a declension of possibility. OUTRIDER claims the source to be a way of regarding the terrain, thus a View. OUTRIDER is a statement about language and its purpose. And the cries of animals. Not no ideas, but no ideas but in projectiles of things. OUTRIDER is a documentarian. Old archivist of imagination. OUTRIDER is One that rides. OUTRIDER cannot consume its own theory. The page becomes a terrain, an abode, a mystical site. I am casting about for ways to make progress on an article, which seems poor as I write it, but then looks good when I come back and see what I have written. It is on two poets, both young enough that there is little scholarly work on them. My training makes me want to set them in a tradition. I could easily discuss the relationship of their work to earlier poets they have clearly read. This would be traditional and acceptable, especially since such articles do not already exist. But my strongest sense of the matter is that it is in their relationship to contemporaries whose work, for reasons having to do with mother tongues, they may not know, that the ground is rich and the sparks not yet flown will rise. 1. This is the Whoppin’ Blues with band leader Dr. Michael white on clarinet, Bob Wilder on sax, Mark Braud on trumpet, Fred Lonzo on trombone, Steve Blaylock on guitar, Steve Pistorius on bass, and Shannon Powell on drums. Dr. Michael White is a professor at Xavier University in New Orleans. It is my understanding that he was originally a Spanish professor, but has now moved to an endowed chair in Music. 2. Non-musical notes for today include the death of Boris Yeltsin. I admit I was not sorry, as I disliked him. Denmark’s newborn princess, the first in 61 years, has gone home from the hospital but has not been named. 3. Notes of interest primarily to me today are (a) that my voyage to the Far North is looking problematic. I may postpone it to 2008. The (b) note is that the whitemen are rattling their paper sabers. But they are paper sabers.